We can finance renewable energy with traditional loans or we can finance renewable energy by envesting. The following calculations assume an energy price of 6 cents at the renewable energy plant gate and a running cost of 1 cent per kwh for the renewable energy plant. Using an Interest Rate of 7%, a payback time of 20 years and traditional loans means renewable energy plants have to be built for less than a capital cost of 51 cents per kwh for the loan to be repaid. Any capital cost higher than 51 cents and loans cannot be repaid. When calculating the economic viability of renewable energy we use discounted cash flow calculations which is the same as finance through traditional loans.Using envesting funding and assuming all the repayments are reenvested in renewable energy plants a capital cost of 51 cents per kwh pays back the loan and the rent on money within 20 years. It then leaves long term investors with an envestment that returns 15% inflation adjusted per year for any years of operation beyond 20 years. Using envesting finance, a payback time of 20 years, a long term return on envestment of 7% renewable energy can be profitable up to 65 cents capital cost per kwh. If we extend the payback period to 30 years the renewable energy can cost up to 142 cents and still be profitable. We know we can build large scale solar thermal energy plants for capital cost of 46 cents per kwh and we know they will have a working life of greater than 20 years. This is equivalent to a long term return of 20% where the pay back time is 20 years and where the envestment pays 20% beyond the 20 years. Today using envesting finance we can profitably build as much renewable energy as we want without increasing the price of energy. Why is there a difference between the two funding methods? The difference comes because with envesting we assume that the repayments are used to build more renewable energy plants while with traditional loans we assume that the repayments go to pay off the loan. With envesting compounding works to build more profits while with traditional calculations compounding works to increase the cost of finance. This happens because envesting we use zero cost money while with traditional loans we pay an unnecessary fee for the right to use money as a measure of value. The following graph shows the long term rent on money for envesting versus the payback time for a capital cost per kwh of 68 cents. 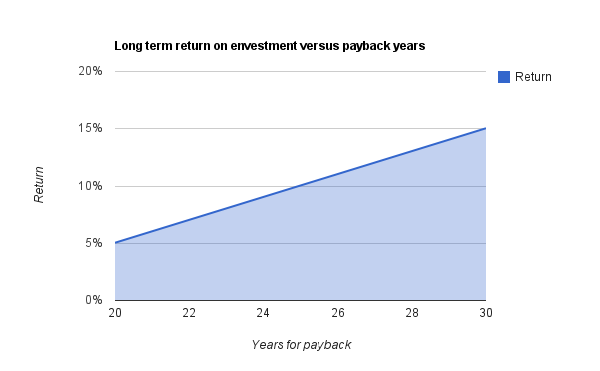 Note the linear nature of the graph and the effect length of time has on the final rate of return. This means pension funds could envest heavily in renewable energy plants so they can meet their future financial obligations to their members. Money envested 30 years ago will give an ongoing 15% per annum adjusted for inflation with renewable energy built for a capital cost of 68 cents per kwh. Kevin, this all sounds good and it may very well work out the way you describe it. However, me not being a math person, it kind of looses me. I’m a 1+1=2 person. The main question I need answered is this. When you take out a mortgage for example, as you are paying down the principle, your interest charges also go down and so on until the debt is all paid off. What I don’t understand, is if you “rent” money, what and how is the amount of rent determined and does it stay the same amount until the mortgage is discharged, or does the rent vary as the payments are made? In either system, the way I see it, you are still paying for the cost of borrowing money. What I would like to see, is for our Federal Government pay for the cost of infrastructure without interest and in the private world that interest be capped at 6% and that banks can only loan out their own capital and not depositors money. Besides banks making money by loaning out their own capital, they make money by charging service charges to depositors. With many banks, competition would keep these charges at a low rate. David the difficulty in understanding what goes on is that when you borrow money to pay off a loan the amount you end up paying is related to the rate at which you pay off the loan and nothing to do with the value of the asset as expressed by rent. With envesting the amount you end up paying is related to the rental rate or value of the asset. This means it is very difficult to compare the two methods. However, we know that for any repayment rate the buyer will pay less by using envesting and we know that we can adjust the rental rate so that the buyer still pays less and the seller gets more. If the middle man (the new money created as a loan) is removed then both the buyer and the seller can win. Who loses? Well no one loses directly because the extra cost is absorbed into the system and is paid by the community through inflation of the money supply and in the less productive use of assets. The use of loans that creates new money introduces unnecessary friction and costs into the system that are paid by society as a whole.